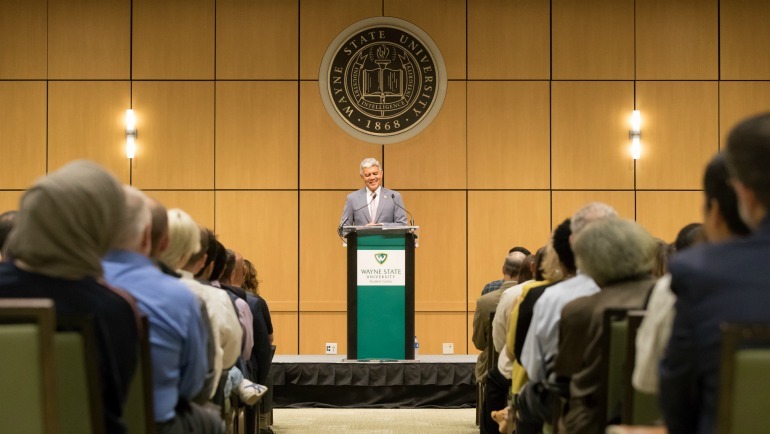 With Wayne State University’s Strategic Plan (2016-21) nearing its midpoint, President M. Roy Wilson used his sixth university address to update the campus community on its progress. Community college transfers are also up 7.1 percent, and the university reversed a nationwide trend of declining international students with a 3.5 percent increase over last year. Despite the increasing numbers, overall enrollment is somewhat flat. As Wilson explained, there are two reasons for this. A key priority in the strategic plan was to increase the six-year graduation rate to 50 percent by 2021, and the university has made significant strides toward this goal. Wilson said Wayne State’s six-year graduation rate is now about 47 percent, an increase of 19 percent over a period of six years, and slightly up from last year. Although it’s not an official goal in the strategic plan, Wilson told the crowd he wants the university to develop and implement a four-year graduation plan, noting that six years should not be the standard completion rate. On the research front, progress has also been made in several areas. Federal research award funding has increased by 14 percent since 2014, and research expenditures notably went up in 2016. As part of the goal to expand the research enterprise, Wayne State has established the Translational Neurosciences Initiative, the Healthy Urban Waters Initiative, and the Translational Science and Clinical Research Initiative. To enhance the pipeline of student researchers, undergraduate majors are being built in several key subjects. An undergraduate degree in public health that launched in 2016 has been extremely popular, and curriculum is currently being developed for an undergraduate major in neurosciences, which should be completed in about a year. Innovation and entrepreneurship are a cultural value and strategic focus area in the plan. To improve the speed and effectiveness of Wayne State’s engagement with businesses, the university is developing a Wayne State Office for Business Innovation (OBI) that should be operational by winter 2019. Establishing the OBI will allow the university to create new public/private partnerships to continue to innovate research and development, accelerate the process and effectiveness of tech transfer opportunities, and explore exciting business opportunities. “Wayne State is well positioned to do this successfully. We’ve got lots of talented faculty; we’re located in Detroit, where new industries and technologies are being developed; we’re aligned with the TechTown entrepreneurial ecosystem; and we have a history of innovation and entrepreneurship,” Wilson said. The president noted that enrollment and the successful completion of the $750 million Pivotal Moments capital campaign are key metrics in good financial health, but to get a better picture of the overall financial health and stability, the university tracks financial ratios and other measures in a “composite financial index,” or CFI. Wayne State’s CFI is going up and surpassed its goal this year. Despite significant strides in many areas, Wilson noted that progress is needed on other metrics, including the establishment of a centralized community engagement database, improving the budgeting process and completing a campuswide Wi-Fi upgrade. Wilson wrapped up his address by thanking everyone whose dedication and talent has contributed to making Wayne State a better place, and asking for their continued support.